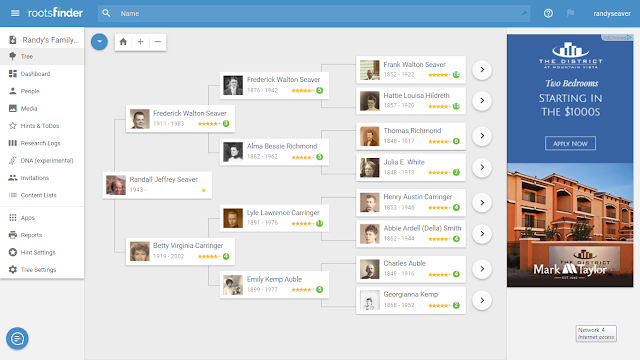 I posted RootsFinder Delivers Powerful New Tools to Genealogists for FREE on Saturday, 17 February 2018 and immediately tried to use it. Yesterday, I went through the program menu items in Getting Started With RootsFinder - Part 1: Program Menu Items. In this post, I'm going to look through a profile in my RootsFinder online family tree. 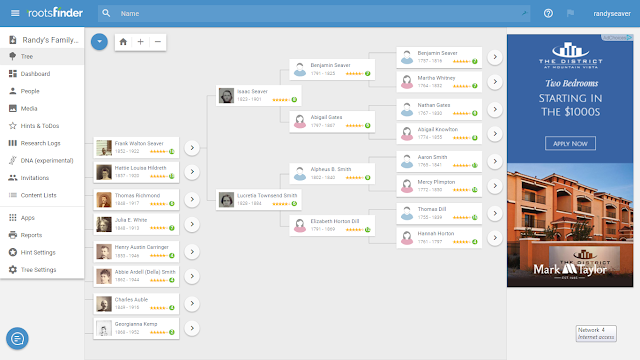 Since I imported this tree from the FamilySearch Family Tree, the profiles depend upon what is in each FamilySearch Family Tree profile. 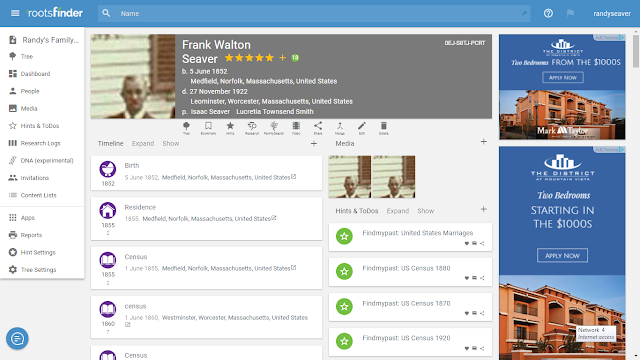 2) I'm going to look at the RootsFinder profile of my great-grandfather, Frank Walton Seaver (1852-1922), who has a FamilySearch Person ID of LCRC-8K6. The popup box for this profile opened, and there are three buttons below the person summary - for "View Tree," "View Profile," and "Edit Profile." There are lists presented on the window above for "Spouses & Children" and "Parents & Siblings." Each profile has gold stars for the number of "Evidences" (sources), and a green circle with a number in it for the number of "Hints" found. * A summary of the person's profile (in the gray background area on the screen above) - name, birth, death, parents names, gold stars and the Hints green circle, plus a RootsFinder ID number (which seems to have no relationship to the FamilySearch Family Tree ID). 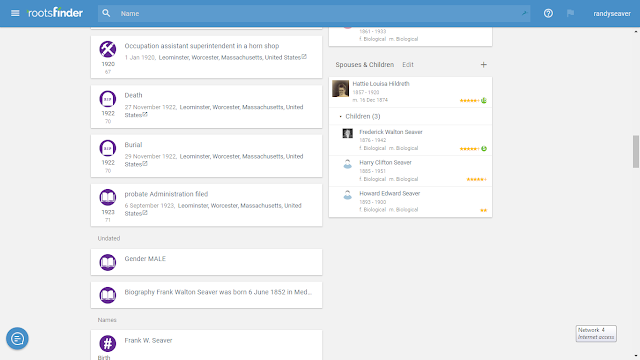 * In the left-hand column below the profile summary there are lists of the "Timeline," "Names," "Other Sources," "Notes," and "Research Logs." 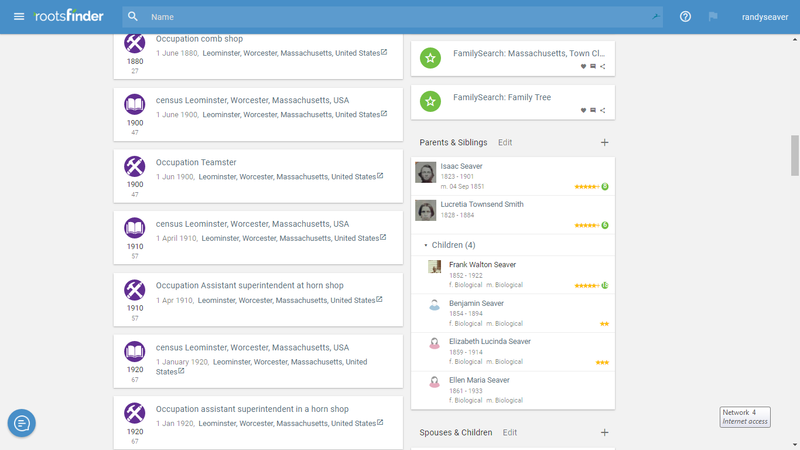 * In the right-hand column below the profile summary there are lists of the "Hints & ToDos," "Parents & Siblings" and "Spouses & Children." * Below the summary profile, there are icons provided for "Tree," "Bookmak," "Hints," "Research," "FamilySearch," "Video," "Share," "Merge," "Edit" and "Delete." You can see each Timeline item (with a date and age, the event type, the event place, and the gold star to indicate a source is available. 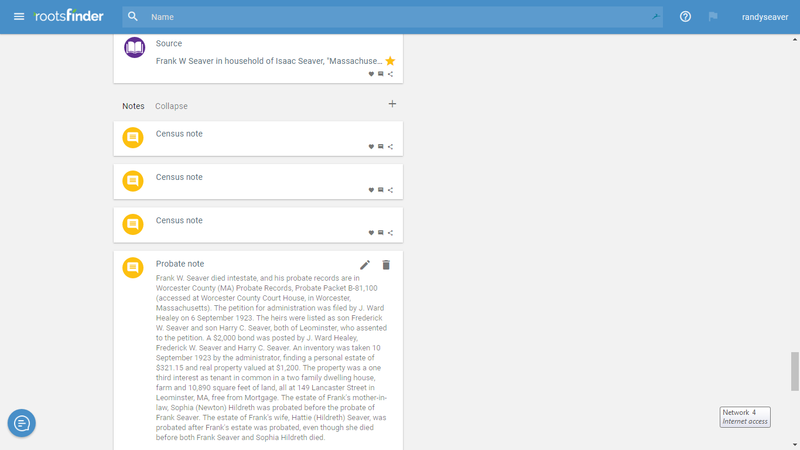 By clicking on the Event type, the user can see an Edit Event icon and a Delete Event icon, plus a field to add supporting evidence. 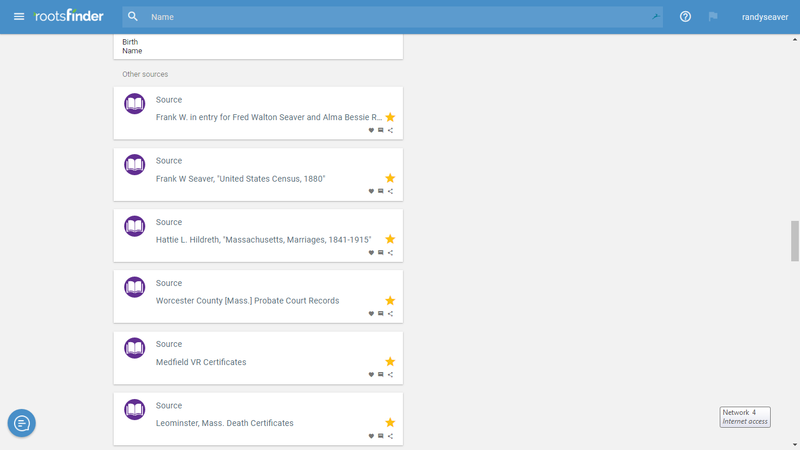 For a Timeline item with a gold star, you can click on the star and see the Evidence provided. By clicking on each Hint item, you can see the record provider, the Hint content, and a link to the Hint. There is also an "Edit Hint" icon and a "Delete Hint" icon. I believe that the Biography in this case is obtained from the "Life Sketch" field on the FamilySearch Family Tree. 7) Still further down, the "Other Sources" are listed. 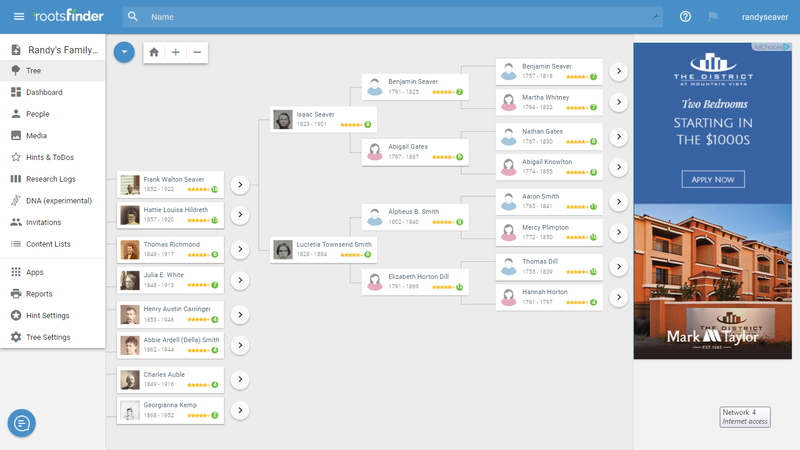 I believe that these are obtained from the "Sources" list on the FamilySearch Family Tree profile, which are not keyed to an Event in Family Tree. 8) Still further down the list on the left-hand side are the "Notes." I believe these are obtained, in this case, from the FamilySearch "Notes" list on the FamilySearch profile. I clicked on one of the "Notes" on the screen above to see the content. 9) The last item on the list in the left-hand column is for "Research Logs" (not shown on the screens above). 10) The user can add information to any of these fields by clicking on the Edit icon or the "+" (Plus) button. 11) There is a lot more work to do on a person Profile in RootsFinder. 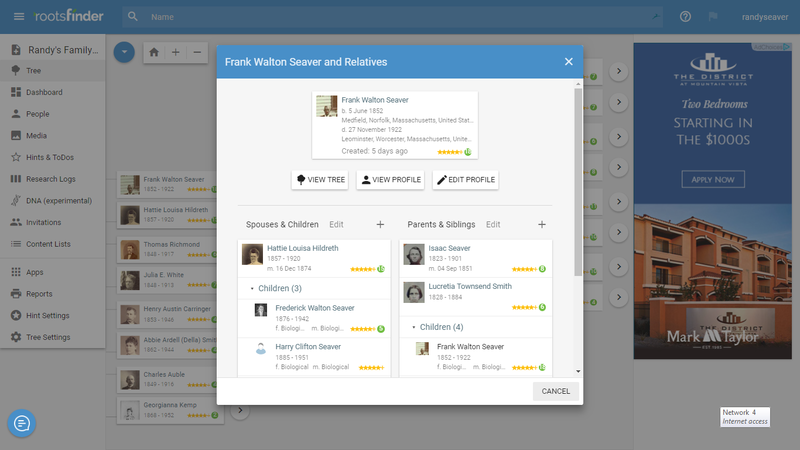 So far we've looked only at the information that is imported from the FamilySearch Family Tree. 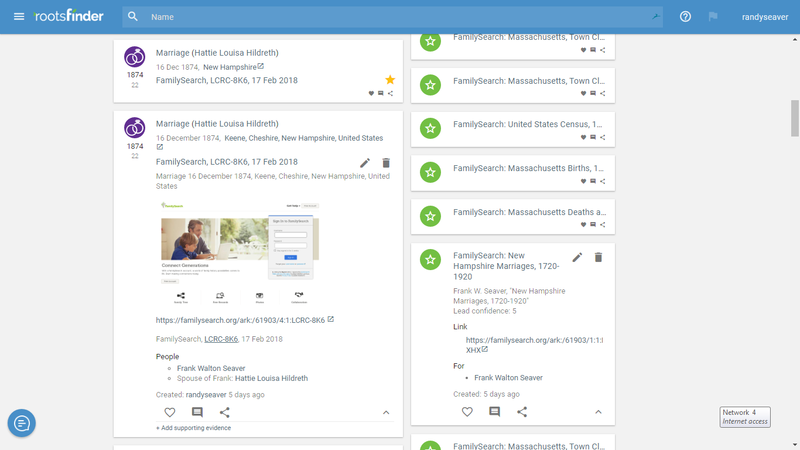 It appears that just about every field on the FamilySearch Family Tree profile for a person was transferred to RootsFinder, with the exception of the "Changes" and "Discussions" fields. In the next post in the series, I want to look in some detail at the icons below the person's Summary Profile. NOTE: I have received no remuneration for writing this blog post or accessing RootsFinder.com. I am in the process of reviewing the RootsFinder program.